An intranet manager recently asked for advice on how to get people to use the appropriate collaboration tool. In a partial response to the issue, I’d like to share some findings from the 2007 Global Intranet Survey. 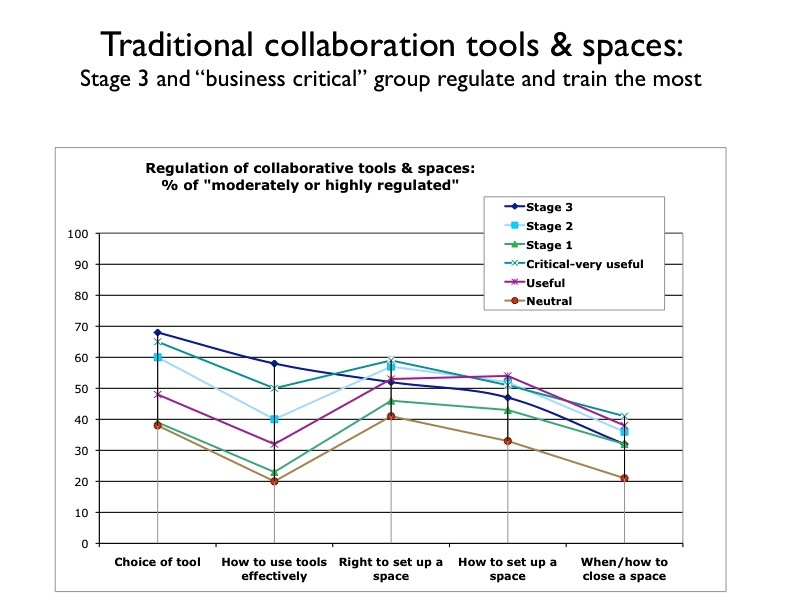 The data showed that companies where the intranet is “the way of working today” have a higher degree of regulation on tool choice, give more training and have more usage policies than the other organisations. Definitions: Stage 1 represents intranets that are 3 or 4 years away from being the way of working for staff; Stage 2 represents those where it is becoming the way of working and is from 1 to 2 years away. Stage 3 represents those where it already is the way of working. A second segmentation is also used on the charts: “Critical-very useful” are those organisations where senior management considers the intranet to be “business critical” or “very useful”, “neutral” is where their perception is either “neutral” or “indifferent”. The survey was conducted with intranet managers, and reflects their opinions. The first slide relates to “traditional” tools. The slide below relates to 2.0 tools. 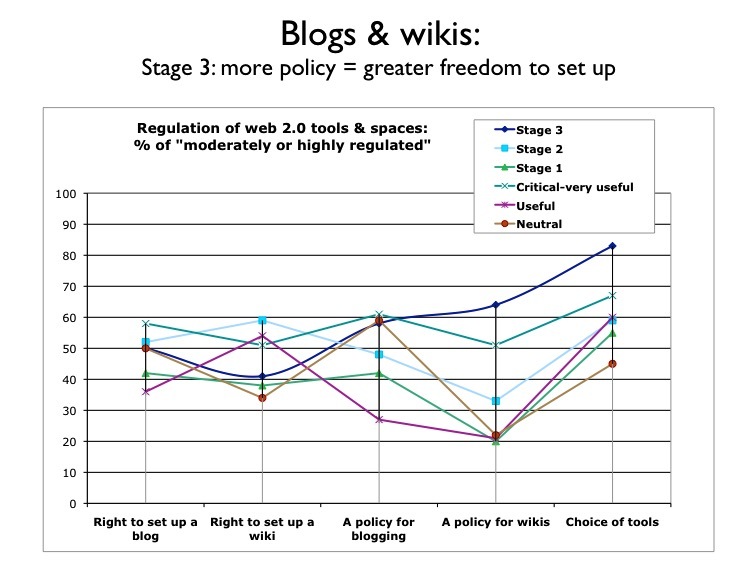 You’ll see that although organisations with Stage 3 intranets regulate the most for the choice of tool, and also have the highest proportion of blogging and wiki policies, they regulate the least regarding who can set up a blog or wiki. Their practice seems to be: same tool, policies and training, then let the people go! This data, more from the 2008 survey about to start, and numerous on-going case studies from organisations around the world will help us define good practices in these areas. Adoption is always the biggest challenge. The organisations I know firsthand feel that it is essential to have everyone on the same tool (to faciliate exchanges across the enterprise) and to provide both guidelines and training to users. One debate I find fascinating is “to what extent does the tool help create a need?”. I recently had the opportunity to discuss with a group of IT Directors in the pharma industry. Several (a minority) felt that making social media tools available would help people in their organisations better understand what purposes they can serve. Others (the majority) felt that doing so before a need was expressed and governance established would present too many risks especially in companies working in such a highly regulated a sector.